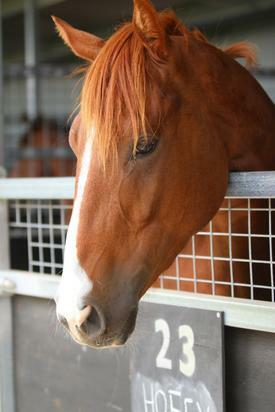 BON HOFFA (AUS) (Chestnut 2002-Stud 2009). 9 wins to 1700m, MRC Sir Rupert Clarke S., Gr.1. Sire of 183 rnrs, 97 wnrs, inc. SW Bon Aurum (MRC Sir Rupert Clarke S., Gr.1), Deiheros and of Top Sight, Sweet Emily, Best Hoffa, Sallanches, Ambitious Speedy, Ample on Offa, Bonee Tess, Galaxy Warrior, Good Offa, Hoffsetter, Vintage Bon, Allez Chival, Bon Rocket, I'm Ablaze, What a Buzz, Bedrock Dreams, Gibbon, Bon Elise, Bonify, Fantasy Eight, etc. Country Tide (g. by Belong to Me). 8 wins to 1100m, A$89,990, 2d AJC Manning H., Stroud Park H., 3d AJC Rose Bay H., Rowley Park H.
Miss Godden (f. by Half Hennessy). 3 wins from 1700m to 2250m in Aust. ROUSLAN (Ideal Planet). 7 wins-2 at 2-to 1400m, A$673,620, QTC Stradbroke H., Gr.1, STC Theo Marks H., Gr.2, AJC Royal Sovereign S., Gr.3, Bill Ritchie H., L, STC AWA Club Keno Quality H., AJC Malaya H., STC Bobby McGees 2YO H., 2d AJC Villiers S., Gr.2, VATC Sandown S., Gr.3, STC Heritage S., L, Hawkesbury Gold Cup, L, 3d AJC Shorts H., Gr.3, STC Royal Parma S., L, 4th VRC Salinger S., Gr.1, AJC Challenge S., Gr.2, BATC Foster's Cup, Gr.2, STC Canterbury S., Gr.2, SAJC Tokyo City Cup, Gr.3. Thunder Bird. 2 wins at 1300m, 1600m, VATC Aare H., 2d VATC Imposera H., 3d VATC Midnight Fever 2YO H., Highways Tabaret 2YO H. Producer. Aadelaidee (Keltrice). 3 wins-2 at 2-at 900m, 1000m, A$85,690, SAJC Its Our Buy H., 2d SAJC Dequetteville S., L, Dermody Lightning S., L, MRC Caulfield Classic Style Award H., SAJC Fosters Australia H., 3d SAJC Queen Adelaide S., L, MVRC Santa Claus H., SAJC Workers Union 2YO P., SCTC Bi Rite Electrical Caloundra P. Producer. Sagapuss. 3 wins at 1150m, 1400m to 2015-16, SAJC Drink Driving? Grow Up H., Schweppes H., 2d SAJC Boxing Day Family Races H., Mac Drink Driving Grow Up H.
Brancusi. Winner at 1300m, 3d STC On the Spot Tyres H., Yowie Ice Cream Giddy-Up Club H.
Princess Hallowell. 2 wins at 2, A$136,000, WATC Westspeed 2YO P., Frank & Rona 2YO P., 2d WATC Westspeed 2YO P.
KING CREOLE (Elvstroem). 8 wins from 1350m to 1800m to 2016-17 in Macau, Macau Winter Trophy, L, Christchurch H., 2d Macau Directors' Cup, L, 3d Macau Grand Lisboa Cup, 4th Macau Directors' Cup, L.
CHARM'S HONOUR (Strada). 4 wins-3 at 2-to 1200m, A$133,250, BRC Mode P., L, 2d ATC Keith Mackay H., L, 3d ATC Sky Farewells Randwick H., 4th ATC Eskimo Prince H., L.
Regal Span (Kingsbridge). 6 wins from 1400m to 2100m, BOP RC Hit Account H., ARC Bluebird Foods Qualifier, Haunui Farm H., 2d Marton Cup, L.